Now here's a new name to this column as Tom George at Tom George Yacht Group tells me that he's just signed the 28.6m Hargrave raised pilothouse motor yacht Ajilati for sale. 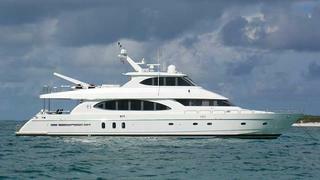 Built in 2003, she sleeps eight guests in four staterooms and features a fully enclosed skylounge with a hot tub aft. Currently being transported from Seattle she'll be available for viewing in Fort Lauderdale from mid-August, asking $3.595 million. Also on Tom's books is a 34.1m Westport 112 raised pilot house motor yacht, Kelly Sea, that's had a price reduction to $7.285 million. She received $800,000 worth of upgrades over the standard Westport 112 when built in 2006, including a fully telescoping passarelle, ASEA power system, and full 50/60 Hrz power for cruising in the Mediterranean. Having completed her annual maintenance yard stop last month, this superyacht is ready to cruise the 2010 season. Both Kelly Sea and Ajilati will be exhibited at the upcoming Fort Lauderdale Show at Las Olas Docks, North end.